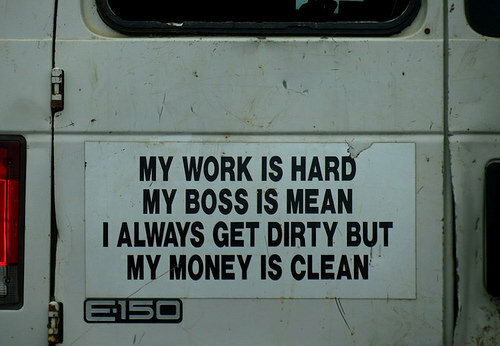 I think the main issue with this 'rhyme' is the use of the phrase 'dirty but'. Surely his but should have started on line 4 of the verse, thus the co-ordinating conjunction then clearly shows the difference between the two statements whereas in the poem, it suggest he always has a dirty but. Obviously the use of a comma after 'dirty' would have helped. Would anyone like to offer an alternative critique to this otherwise mildly humorous ditty. Anon, maybe you would, perhaps..? More gin, anyone?? So have a f*cking ticket. "Is it fit to drive?" "Not sure it's really ode worthy". put bad poetry onto his truck. 'cos he just didn't give a damned monkeys. (nod to 20.05.47, which I hadn't seen). You don't see many Nissan Stanza Wagons these days. Ford vans are renowned for their ode holding. By Mudyard Kipling. (He wrote exceedingly good japes). Only because you work for the local launder-ette. I see that Morrissey has sent his advance man to Glastonbury. "When did Walt Whitman become a plumber?" "You're a plumber's apprentice, Neil. What did you expect, roses and pot-pourri floating down the drains?" is at poetry they are not pucker. with the fact he's a talentless f*cker. Man with a van Morrison. By Oscar's grand nephew, Ivan Wilde. Are you a laundery van driver?